Tuesday, August 13, 2013 at 10:09PM A previous post covered double-lined shapes in older versions of Visio , in this one I'll show you that the process got much simpler in Visio 2013. Let's start with a simple rectangle with a 6pt black line as shown below. 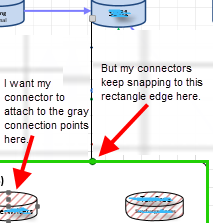 Connectors have Smarts, and Connector types are just one example of how Creately makes diagramming easy. Different Knowledge Objects support different connector types, and the connection type can be selected from the drop-down selection box on the contextual toolbar. Changing the connector type will change the look of the line and gluepoint styles.